Ottawa Senators owner Eugene Melnyk stands near the ice as members of the media are given a tour of changes to the Canadian Tire Centre in Ottawa on Sept. 7, 2017. Melnyk is suing his business partner for $700 million in a development deal that was meant to bring a new NHL arena to Ottawa's downtown. Just when everyone thought it couldn’t get much worse – it gets a lot worse. The long-anticipated redevelopment of prized downtown riverside property within a slap shot of Parliament Hill – a partnership promising a $4-billion residential and retail project complete with a $600-million NHL arena – was considered on such shaky ground Thursday that Ottawa Mayor Jim Watson warned them to “get their act together” within the next couple of months or else. On Friday, that partnership seemed to crash and burn when one partner sued the other for $700-million. The shocking news was delivered less than 24 hours after the partners separately recommitted to the project and pledged “to work towards the right solution” on “this important civic project.” That was Thursday; this was Friday. 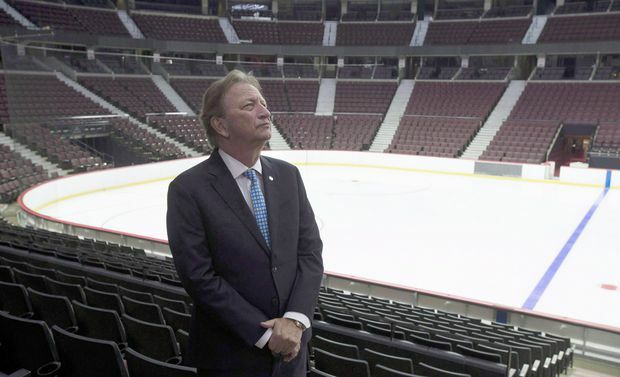 The group led by Ottawa Senators owner Eugene Melnyk, Capital Sports Management, launched the massive lawsuit against John Ruddy’s Trinity Development Group over the “failed joint venture” of developing LeBreton Flats. The suit also names Graham Bird and his consulting and property-management company that has been working with the Ruddy group. The Melnyk group is “seeking damages arising out of a failed joint venture between Trinity and CSMI.” The failure, the suit contends, was an inability to finalize a master development agreement for the LeBreton Flats property. The National Capital Commission, which oversees federal lands in the capital area, had scolded both sides Thursday in a public board meeting for failing to meet a Nov. 1 deadline for an agreed-upon master plan. The NCC gave the partnership until late January to get it done or else “a new process” would begin that might involve other potential developers. According to the suit filed, Capital Sports Management alleges that the project went off the rails “because of an egregious conflict of interest” on the part of Trinity and Ruddy, its principal. Further details of the legal action reveal a deep rift between Melnyk’s group and the mayor, as well. The suit alleges that Watson’s office used “threats and intimidation” to ensure that Capital Sports Management did not withdraw from the project during the fall municipal election campaign, an act that would have reflected poorly on Watson’s leadership. By Friday morning, it couldn’t have “worsened” more. The surprising development kicked off a weekend in which the city of Ottawa should have been in sports heaven, with the Ottawa Redblacks in Edmonton to play the Calgary Stampeders for the 2018 Grey Cup. Instead, sports fans in the national capital merely twisted some more in the year-long hell that has been the Senators on- and off-ice troubles, a situation that recently gained international attention when The Guardian newspaper tagged the franchise “pro sports biggest mess” in a headline. Should the NCC board of directors decide to begin “a new process” at their late January gathering, having determined that the current project is too poisoned to proceed, it could conceivably turn to the runner-up in the competition to develop the abandoned industrial yards. Devcore Canderel DLS group had dramatic – some would argue loopy – plans for the 21.6 hectares of NCC land, including an NHL rink, though they don’t have a team, an aquarium and a car museum, but they also had deep pockets in the likes of Gatineau developer Jean-Pierre Poulin, André Desmarais (Power Corp.) and Guy Laliberté, co-founder of Cirque du Soleil. Laliberté, who has also visited the International Space Station as a space tourist, and has been a professional poker player. In other words, perfect for whatever the next chapter holds in the bizarre tale of LeBreton Flats.